Ipswich IP1 2EF from 1.00 to 1.50pm. 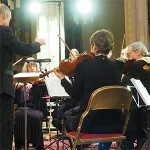 Trianon Music Group is one of this region’s largest music organisations. Based in Ipswich, with over 200 members, it has become a brand name for exciting classical concerts and celebrates 60 years of music making in 2019. In this talk, its founder, Chris Green OBE traces its development starting with a small youth group in the mid 1950s, which became inextricably linked with Ipswich social developments and the changing face of youth culture. To mark Trianon’s 60th anniversary, Chris Green has written a new book The Trianon Enigma, sharing his memories of the last six decades and his thoughts on the way forward. Copies will be available to buy after the talk. ADMISSION IS FREE with a retiring collection to defray expenses. Donations of at least £2.00 per person are valued to maintain the series.